This interview was previously published in World Sculpture News, 6(4), pp. 51-3 in 2000 with the title "Dissecting reality". Left: Lisa Holden. Canvas, (2000). Performance view of Holden behind canvas-framed window with spotlight, introducing UNLEASHED. Right: Lisa Holden. Seed III and Seed IV (installation view), (both 2000). Pixellated digital photographs, reflected in a pre-war period mirror which survived the bombing campaign. Both prints 33.1 x 46.81”. In some ways, looking at Lisa Holden’s art is like watching the Jerry Springer show. Guest #1 tables a narrative— the truth apparently complete. Yet new information is revealed, and reality shifts and twists, leaving the viewer with multiple truths, and not knowing what to believe. Holden’s artwork plays on these layers. In a romantic, futile quest for meaning of both past and present, she interprets and projects a society living in fact-fiction fusions. 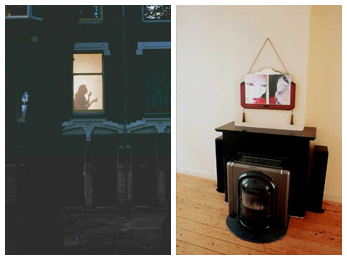 In her recent site-specific installation, UNLEASHED, Lisa Holden positioned a former two-story residence— now Ron Mandos Gallery in Rotterdam, the Netherlands— as a historical container of voices, memories, discourses, fantasies, and spirits which the viewer experienced through sight and sound art. Experiential voicescapes and sound remixes were combined with performance-installation and digital photographs. Infusing her own experiences into the site, the result blended stories across past and present, layers of fact and fiction, memory and fantasy. Thirty-eight-year-old Holden, British-born, Netherlands resident, has been featured in many group shows in 2000. At Amsterdam’s Arti et Amicitae, Holden was pitted against Yasumasa Morimura in Cos[tume]-Play, which featured several Japanese and Netherlands-based artists. At the Castlefield Gallery, Manchester, the United Kingdom, Holden bizarrely opposed British drag-star-turned-art-curiosity Divine David in Apocalypse Now and Next Week! Additionally, Holden participated in Location at Elastic Gallery in Sydney, and the Brussels Art Fair with Danielle Arnaud Gallery, London. UNLEASHED’s curator, R.J. Preece, interviewed Lisa Holden about the installation’s various layers, which were both visible and invisible to viewers. R.J. Preece: Your artwork has been negatively criticized by some in Holland’s art scene as being too "heavy". How do you respond to this? Lisa Holden: My work deals with stripping back the masks we present to our world. It’s just a reflection of the reality around us— and I want to dissect that reality, not run away from it. If delving into the psyche and our inability to control our realities is "heavy", then so be it. R.J. Preece: What was your starting point for UNLEASHED? Lisa Holden: In general, my work deals with notions of truth and appearances, hidden agendas and discourses, and the impact this has on the individual. With UNLEASHED, I considered the site to be a container of these discourses, and I wanted to explore the psychology of the house’s former inhabitants, yet spin it with interpretation. The house as a “container” of different things— past and present— continued as a reference point. I found two aspects of the site particularly interesting: the history of the house— built around 1910— within the context of Rotterdam’s history, a city almost entirely obliterated during the World War II bombing. The house survived this, functioning as an architectural ghost in a city dominated by Post-War construction. One can only imagine what the house saw, what the residents experienced— and the smells. I interviewed survivors, and they kept talking about the smell, they couldn’t get it out of their clothes. Second, for 60 years before the house became a gallery in 1998, two brothers and a sister lived there, all unmarried. This was my starting point. R.J. Preece: Your artistic process for this site intervention paralleled and departed from your previous ones. Could you explain this? Lisa Holden: In my previous work, I used myself as the model for digital photo-works and my own texts and voice in sound installations. But for UNLEASHED, rather than drawing upon personal inspiration, I took a stance about what the history of the house was, and then I had conversations with the space. This included sleeping in the empty house overnight, recording its sounds, and, to some extent, calling its spirits. I wanted to open the house “up”, deliver the feeling of accessing the hidden, to see and hear the unseen. I interpreted the house as a container of pent-up energy: outwardly calm, but the further you go, shadows grow deeper, darker, and more plentiful. Concurrently, I wanted to instill doubt about the spaces, to have the viewers experience being taken on a ride, to question the authenticity and stability of this “truth”. R.J. Preece: Within the site, the artworks are positioned like a spiral. What do you think viewers experience, and what is the end result? Lisa Holden: The show starts with a calm surface— with the installation-performance Canvas. You walk along the street and stumble upon the house. As Ron Mandos’s exterior is discretely positioned amidst the street’s residential fabric, I was aiming for viewers to deal with their own voyeurism. Interestingly, when the piece was tested, many residents stopped and watched, without neon signs declaring "Art". I wouldn’t exactly call it a spiral, but I did reposition the house as spaces of transitory psychological realities. So, with Canvas, the viewer is confronted with the surface, not knowing really what’s going on beneath it, and witnesses a “lateral” transformation— my switching across characters that occupied the house. Inside, the more literal images like Pink reflect the interior of the house and inhabitants. With Bite, the viewer is invited upstairs, to explore even deeper. R.J. Preece: With Bite, you’ve positioned the apple as a fetishistic object and one that is integral to the installation. Why is that? Lisa Holden: The girl biting the apple is the crux of UNLEASHED, pivoting the more literal images into abstract psychological states. Meanwhile, the installation’s imagery and spaces are all the same, drawing from the same spirits, but revealed at different levels. The apple does indeed refer to the Garden of Eden "Before and Beyond the Bite". It plays off Rotterdam as a site, the city’s 20th century inhabitants, and the former occupants of the house. The fruit acts as a vehicle to get underneath the surface. It also connects the two floors and emphasizes the uncertainty of walking upstairs in someone else’s house. R.J. Preece: The second floor spaces seem to really take off, and become rather twisted. Lisa Holden: I don’t know if I’d call them "twisted", perhaps "heavy" is better! The viewer then enters a dark room with the sound piece The Visitation, which talks about things the inhabitants don’t want to face. Certainly things outsiders usually don’t want to know. R.J. Preece: Yes, that piece seems to contrast your stable voice quality while you’ve adopted a survivor’s frightening memory of the bombing, and the medium works well in that it pits the downstairs visuals against the layer of a voice. Across the hall, the interior Canvas also seemed to work in two ways. At the opening, the door to that room was closed, and the viewer could only see your reflection through the window’s frosted glass door, and the emphasis was on “the hidden”. Afterwards, you stressed the artificiality with the performance’s objects exposed “behind” the canvas, and projected slides in the evening with stock “silhouettes”, twisting Canvas’s presentation. Lisa Holden: Yes, exposing the layers is the key to UNLEASHED. In the two final rooms, three Seeds [III-V] are flooded with light, and the psychological core emerges beyond the Bite. The accompanying sound piece Unleashed is a remix of voices, interview texts, the house’s sounds, and even discussions relating to the show. It’s fractured, connected and disconnected simultaneously. I’m highlighting the many surfaces and ripping them back to expose more, at the same time emphasizing the other surfaces that are unknown. The outdoor lighting floods in and exposes— those in neighboring flats can peer in. The core is set free, if it in fact wants this. R.J. Preece: In the images, you are the model and the works in this show are partly drawn from your personal experience. Could you tell me about that? Lisa Holden: My interest in transformation, reality / appearance, and hidden layers could be rooted in my being adopted. Growing up in northern England with a non-English heritage, my imagination ran riot having many unanswered questions about my origin. I always stared at my reflection wanting to know what was inside me, who I was. To some extent, I identify with the house as it has no history— all its records were destroyed in the War. We can’t even give an exact date when the house was built. This is Rotterdam’s current reality looking back, before the bombs. R.J. Preece: The tittle UNLEASHED has its own layers, doesn’t it? Lisa Holden: I wanted to draw something out of the space itself. The show was also a chance for me to have free rein in terms of media, theme, and choice of work. In the Netherlands, because of the social dynamics, it’s very difficult to get a solo show and make a strong, individual statement, due to the art system. Everything is negotiated, and the group has to be acknowledged. I was rather lucky to work with people willing to take a risk. In some ways, UNLEASHED is also about empowerment. R.J. Preece: Were there other layers that were involved in creating the installation, or behind-the-scenes processes that would provide a more insightful view of UNLEASHED? Lisa Holden: Of course there are. But I won’t give everything away— nobody does. Everyone really knows this. As with any artwork or anything in life, the surface is presented— the viewer is left to their own devices.